Welcome to the vernal equinox (last Sunday). That was when the overhead sun shifted from the northern hemisphere to the southern hemisphere. It is only on the equinox that the sun rises due east and sets due west. In the diagram the word DECLINATION is used to describe the latitude where the sun appears to be directly overhead. This varies in a regular way throughout the year and can be taken as a marker of our seasons. Astronomers, logically, time the seasons using the solstices and equinoxes of earth’s orbit around the sun. By this reckoning, spring starts with vernal equinox. Note that this makes our winter last 93 days and summer 89 days because the earth’s orbit is slightly elliptical and the earth speeds up a bit during our summer. Over the next few weeks, as we get to notice the longer days there will be extra warmth reaching the southern ocean. Sun starts to shine reach Antarctica after six dark months. Just as the coldest part of night for us is just after dawn, so it is that Antarctica gets is coldest temperatures of the year around the equinox. It is the temperature difference across the Southern Ocean that energies the westerly winds found there, and so these at their most energetic, and expand to their furthest north, around the equinox. This is the origin of the term “equinoctial gales”, however I prefer the phrase ”gales of the Antarctic dawn”. The global computer models take weather observations and transfer them onto a grid of dots, thereby averaging the weather out. Features that are occurring between the reports of the observation network are missed altogether, but some data such as temperature is observed in a continuous fashion by remote sensing from satellites and is covered well. The model has to “balance” this matrix of dots to ensure that certain rules are observed, for example all the computed upward motions need to be balanced by down ward motions so that the total atmosphere remains intact. Once a captured pattern is obtained, it is then pushed into the future using dynamic equations using small time-steps. Then another balancing computation is done and so forth. SO the GRIB data of a weather forecast is just a mathematical idea based on the extrapolation of a captured patter. In the real world chaos is continuously jiggling the weather pattern in to different direction, so that the weather forecast deviates from the real world. 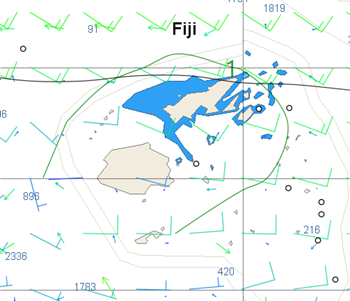 The graphic above shows the normally accessible GRIB data (GFS) over Fiji on a typical trade wind day showing wind flow to be from E to SE 10 to 15 knots. 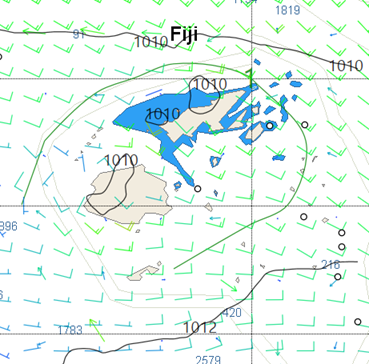 This model has captured some terrain effects—lowering the air pressure in the interior of the main islands of Fiji in the heat of the day, and there by forming a westerly sea-breeze around Nadi/Lautoka and causing an acceleration of the wind on the SW end of Fiji near Navula Passage. All of these terrain effects truly happen, even if they are not resolved by the normal GRIB data. These models with higher resolution and closer dots (and smaller time-steps) require heaps more computing than the normal global models and give a pattern that is somewhat closer to the real world. However there is no increase in the basic weather observation resolution that goes into these models, so they still have limitations. Their output is still just an averaged idea.